International coverage of the 1916 Rising: Portland Daily Press, May 1st 1916. | Come Here To Me! International coverage of the 1916 Rising: Portland Daily Press, May 1st 1916.
International coverage of the Easter Rising in Dublin has long fascinated me, and I have a decent collection of newspaper reports from abroad in the immediate aftermath of the rising. One of my favourites is the Portland Daily Press for May 1 1916. It reported that German officers bodies had been found in Dublin, and also reported on local expressions of support with the rebels among the Irish community in the U.S. The papers report about the “Countess of Markievicz” is interesting, noting a supposed eyewitness account of her shooting and killing a guard in front of Dublin Castle. It’s fascinating to see how news travels and is distorted or in some cases completely fabricated. FIND OF BODIES OF TWO GERMAN OFFICERS AMONG DUBLIN DEAD. London, April 30- Three passengers who arrived on this mornings Irish mail steamer, had an opportunity to observe the situation in Dublin at 6 o’clock Saturday evening. Just before sailing from Kingstown, two hours later, they heard a report of the unconditional surrender of the rebel leaders. Earlier in the day the lull in the fighting was attributed to a shortage in the rebels’ munitions. At the same time this reported seemed to be be belied by the sound of heavy artillery and machine gun fire, which was distinctly heard as the ship cast off. A young officer living near Dublin, told of circumstantial reports of the findings of the bodies of two German officers with the rebel dead in Sackville Street. The representative of a large manufacturer of engines and machinery, who took an exhibit to Dublin for the spring show scheduled at the Ballsbridge grounds, which was subsequently commandeered by the military, brought interesting and fresh news. Newark, N.J, April 30- A resolution was adopted at a meeting of Irishmen here tonight approving the rebellion in Dublin and asserting that in the present crisis it would be a crime to “sit complacently by with sealed lips and palsied tongue” while the “enemy of centuries” bound their native land “to the chariot of empire”. 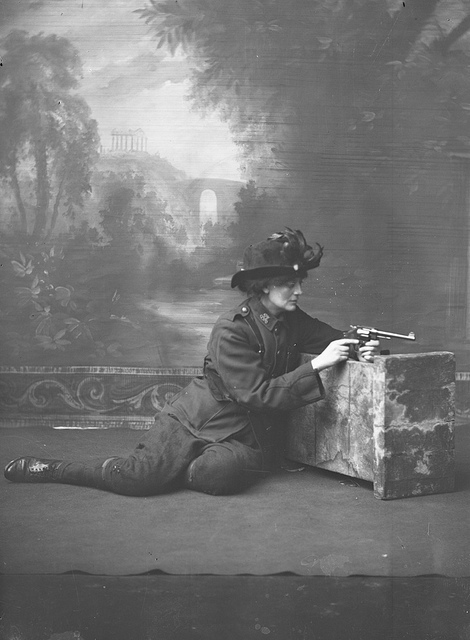 The Countess of Markievicz was a prominent figure in the street car strike in 1913, led by James Larkin. For a number of years she has been an ardent military socialist and Sinn Féiner. According to one Irishmen who arrived in London and who witnessed the disturbances of the first days, in the effort to capture Dublin castle, the Countess shot and killed a guard in front of the castle. I am researching for a book on a Brooklyn, NY gang circa 1916 and in desperate need of NY newspaper coverage of the Easter Rising? The earliest reports available. Where can I find thses?